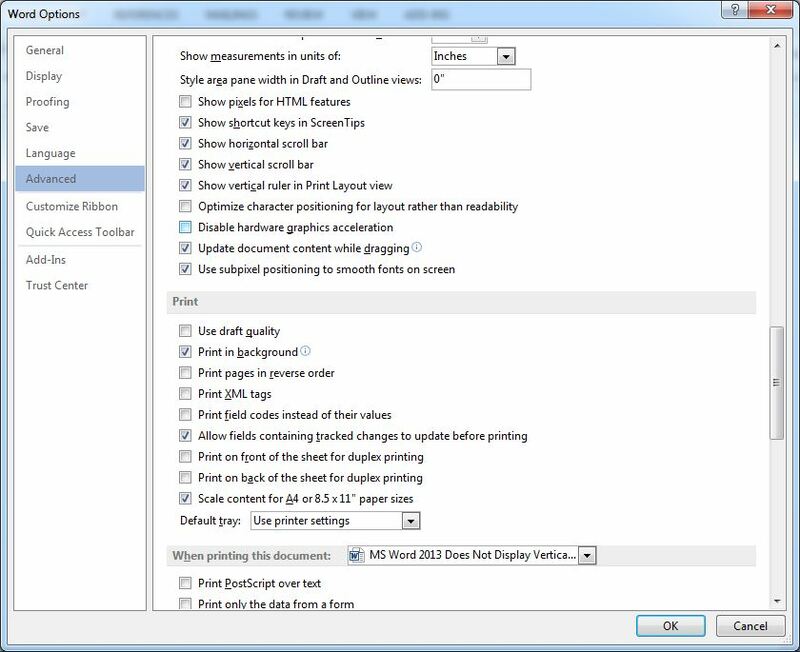 When the visible size of a document in MS Word 2013 exceeds the vertical length of the monitor screen, a vertical scrollbar automatically appears at the left of the workspace of the application. The vertical scrollbar can be clicked and held down, and scrolled up and down to view the contents of the page/document that become unavailable for viewing due to the incorrect or incompatible screen resolution, or the display settings of the MS Word 2013. Although the lengthy document can still be scrolled down or scrolled up by moving the cursor up and down using the arrow keys or by holding down the left button of the mouse and dragging the mouse down or up, the vertical scrollbar makes the navigation within the document far easier. In case you cannot see the vertical scrollbar in your lengthy document created in MS Word 2013, the likely reason would be that anyone might have disabled the vertical scrollbar deliberately, or it has been done so by any third-party application which has proved to be incompatible with the installed version of MS Office package. Fortunately, MS Word 2013 allows you to control the availability of the vertical and horizontal scrollbar from within the Word Options box that is available in the Options option under the FILE tab. When the checkbox representing the vertical scrollbar in the MS Word 2013 is checked, the scrollbar becomes visible. Likewise when the checkbox is unchecked, the scrollbar gets disabled and is no longer visible to the users even in the lengthy documents. By following the process given below, you can easily enable or disable the vertical scrollbar in MS Word 2013. However, considering the situation in this scenario, you would definitely like to enable the vertical scrollbar because it has been disabled due to any reason and you, as an end-user, are annoyed with the behavior. ■From the right pane, under the Display section, check the Show vertical scrollbar checkbox. ■Once done, click OK to save the changes that you have made. ■If required, restart MS Word 2013 to allow the changes to take effect. There are only lines and no numbers to represent what dpi it is ? How am i meant to know what dpi each line represents ? How to turn off AND on display with a key combination? Viewing a laptop display on a desktop PC without remote access? rivatuner's on screen display says that my fans aren't moving when they are. Batch File to Project Screen After Program Closes?